What makes a comic worthy of a “Best of” list? Uniqueness. I’m sure we can all agree that it’s easy for our pull lists to grow longer and longer. We read new comics every Wednesday, but not all of them make the same impression. This year Rich Johnston and the Bleeding Cool writers (not Jude) give you 11 comics to reflect on as we say good riddance to 2016 and welcome 2017 with nervous worry. Motor Crush #1 by Brenden Fletcher, Cameron Stewart and Babs Tarr. Though this very website posted a few retailers experienced initial trepidation in ordering a new independent title featuring a black female protagonist, the release of Motor Crush #1 from Image Comics proved those fears were largely misplaced and misguided.  The terrific trio of Brenden Fletcher, Cameron Stewart and Babs Tarr built upon their pre-Rebirth success reinvigorating DC’s Batgirl to forge a new path with a unique creator-owned title that manages to visually and narratively surprise as much as it delights. The art collaboration of Stewart and the Tarr fluidly moves on the printed page and Fletcher does double duty contributing to the writing of the main story as well as a backup feature previewing his upcoming Isola publication with art by Karl Kerschl. Anyone wanting something different from what’s offered from Marvel and DC should line up at the start line to get their monthly Motor Crush fix before this becomes the next big thing in comics. The buzz surrounding this title became louder at HeroesCon and echoed when the goods were delivered at the end of the year. 2016 may be remembered as a dumpster fire for many other reasons, but Motor Crush gives hope new voices will be heard and have something to say throughout 2017 and beyond. A-Force #4 by Willow Wilson, Kelly Thompson and Jorge Molina. I’m unsure that I really have the words to sum up issue four of A-Force, but suffice to say it’s basically a perfect comic book. This book, more than any other that I read this year gave me hope, pride in general, and a sense of comradery in the team that I have just not felt from any team book, or indie on the stands this year. 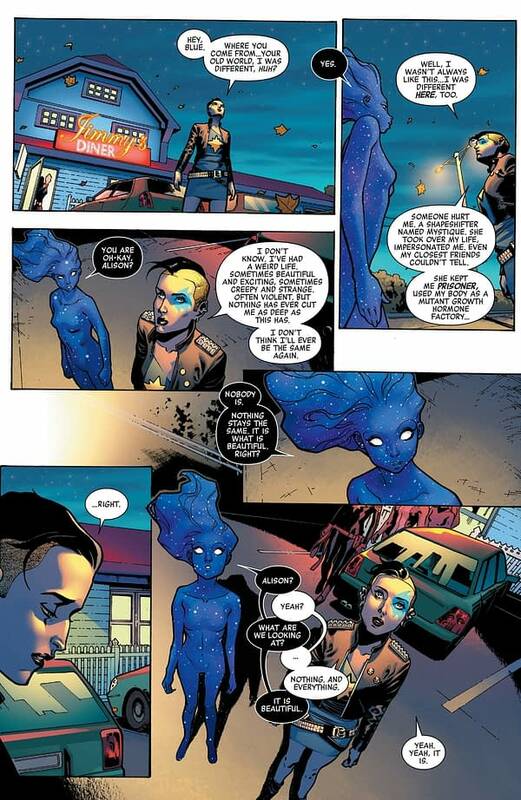 Jorge Molina and Laura Martin’s art evokes the main characters so well and (if I were to focus on one of them) brings the innocence of Singularity to the page like Alphona did with Molly Hayes in Runaways, but Singularity is SO pure, and SO there, that you HAVE to know what’s going to happen to it next. Script wise, G. Willow Wilson and Kelly Thompson just give us everything; non-clunky exposition (A HOLY GRAIL), science, science fiction, conversational depth without overly long dialogue, clever characters, bold heroes, snarky witches, and remnants of a universe that should never have existed as a single entity fashioned in a human form. Finally, though, this year I’ve not gone through the gamut of emotions as hard as I did in this one book, it enveloped me wholly, and took me over. Read the first trade of the post Secret Wars A-Force and tell me that which ever part of it is covering issue four doesn’t get you in your sweet spots, and I’ll give you a jar of my tears to help you along. Stay feely, Bleeding Cool. Oh look, I can did wordsings. Superman #6 by Peter Tomasi, Patrick Gleason, Mick Gray, John Kalisz and Rob Leigh. When Rebirth was announced, I was relived. For me, Superman was one of the characters that suffered the most during the New 52 era. I felt DC never really had a concrete idea on what to do with him, always preferring to keep him…ahem…Grounded. That is not Superman, he needs to be portrayed as the ultimate hero, high in the sky. The opening arc of the Rebirth run accomplished that in the first 10 pages of issue one, but it was this issue, and the page here that brought a tear to my eye. 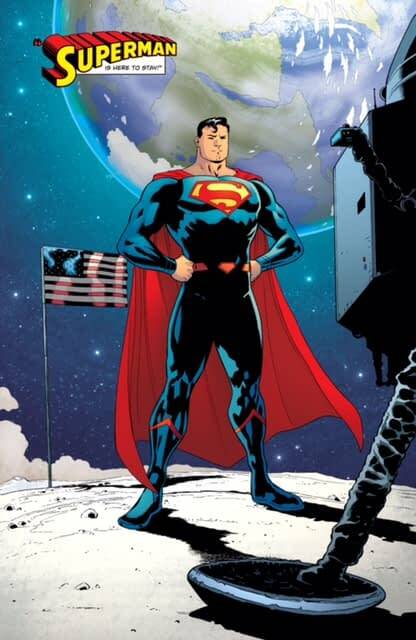 My Superman was back, and this is one of my favorite Superman images of all-time. Yeah, it invokes other images and even Superman 2. But I don’t care. This creative team was born spin tales of the Man Of Steel. I could have picked any issue of the run so far, they are all damn good. I can’t wait to keep taking the ride with them for as long as I can. DC Comics Rebirth Special #1 by Geoff Johns, Phil Jimenez, Ethan Van Sciver, Gary Frank. After years of darkness, grim and gritty takes on favourite superheroes, and seeing characters get maimed, raped, mauled, immolated, decapitated and every other imaginable way of dying, Rebirth brought a breath of fresh air. When DC announced the Rebirth line of books to come, I was initially cautious and pessimistic. I’ve been burned before. But then this one shot came out. And it was Geoff Johns at his absolute finest, going to almost every corner of the DCU and bringing back much-needed light and, most importantly, hope. With a cavalcade of artists each bringing their absolute A-game, the book couldn’t be put down. In fact, I read the book three times in a row, before coming back again and again for subsequent readings later. In a year that’s been pretty rough all over, it’s been nice to have a bit of hope shown, even if just in a comic book. And I am not ashamed to admit, it drew a tear to my eye once or twice too. The possible reveal, if it really is as we all are suspecting given the strong visual, structural and dialogue clues throughout, of the Watchmen characters being brought into the main DCU, and what’s more, being essentially the antagonists behind many of the dark times that have been mixed into comics since the 80s, was controversial, but excellently executed. And if it is how it plays out, I am intrigued to see how that works out. But of course, it all started here. Black Panther #1 by Ta-Nehesi Coates and Brian Stelfreeze. The Black Panther was such an important character for my friends and I growing up in Nigeria, where the scarcity of black superheroes was felt, more so an African one. Thirty years later, saying Black Panther #1 by Ta-Nehisi Coates and Brian Stelfreeze (Marvel) is the comicbook I waited for throughout my childhood might sound like stretching it, but it’s the simple truth. Other runs by other great writers and artists still stand solidly, but the current volume touchesA on almost everything I’ve ever wanted in a Black Panther book. The words which opened the issue set the tone perfectly: “I am the Orphan-King who defied the blood, who defied his country and was divided from you.” And thus began T’Challa’s journey through the deepest troubles he’s ever faced as a king, and as the costumed superhero Black Panther. The issue has it all, including a beautifully-realised Wakanda, new characters, and then there’s the awesome new way the titular character’s costume comes on, no doubt inspired by Kirby-esque tech. The story, which sees the king of Wakanda grappling with internal strife in his kingdom – basically an insurgency – is nicely tucked in at the end by DVD-style extras that proved a splendid touch. This creative team, for me, most certainly put out the best single issue of a comicbook in 2016, and I’m hoping they keep it up in 2017. Black #1 by Kwanza Osajyefo, Tim Smith III, Jamal Igle and Khary Randolph. Black #1 is as in-your-face a comic as I’ve read in years; and in a comic book world populated with mega-crossovers, shared universes and books tailored more for the screen and less for the reader…it’s refreshing to be reading something that’s bold and righteously unapologetic. Writer Kwanza Osajyefo (with co-creator/designer Tim Smith III and artist Jamal Igle; and powerful covers from Khary Randolph) offers-up a world to us that’s sadly and strikingly similar to our own but with one catch: superheroes exist in their world…but as the title strongly suggests, in their world super powers aren’t meant for everyone. Osajyefo’s world is our world but with a twist…and that “twist” quickly forces the reader to confront their personal views on racism, police brutality and our country’s long, bloody and violent history with race relations. Black #1 is one of those rare books that you need to reread once you’ve finished it…and then reread it again a week later to truly appreciate what it has to say. It changes how you think. It changes how you feel. And that’s a pretty rare thing these days. Oh…one last thing: definitely remember the name “Kwanza Osajyefo” because his voice is an important one and one that I’m sure we’ll be hearing from for some time to come. Vision #12 by Tom King, Gabriel Walta and Jordie Bellaire. It’s the rarest joy to find one of those handful of books, songs, films, paintings etc, that manages to hit every note just right. 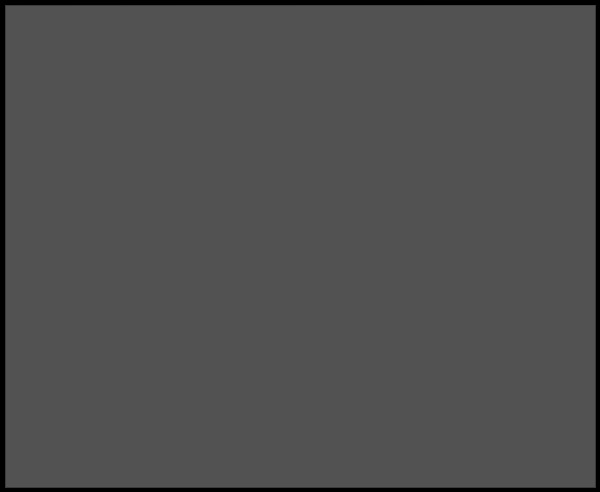 A work that simply makes you incapable of nitpicking because you’re completely lost in it. Add the entire Vision series to that list, but no issue more powerfully than the final one. If quality is measured by emotional impact, Vision #12 gets my unconditional vote as the year’s best. From issue one, a palpable feeling of dread manifests itself into ever-deepening layers of full-blown crisis, in the process forcing the reader to confront uncomfortable questions about humanity and morality. Married to an artistic style that creates a pitch perfect synergy with the text, Issue 12 not only rises to the lofty expectations set by the previous eleven, but exceeds them with that rarest of things: a truly unexpected – and emotionally devastating – final turn. Read with tissues handy. I’m not kidding. You know the kind of people who will bore anyone by talking in extreme details about a specific medical problem they are suffering with? My mother-in-law and her eyelashes, my mother and her ears, and get me in a pub corner and count the seconds till I start talking about my gout. Well, with Pope Francis, it’s his teeth. And possibly my favourite comic of the year. 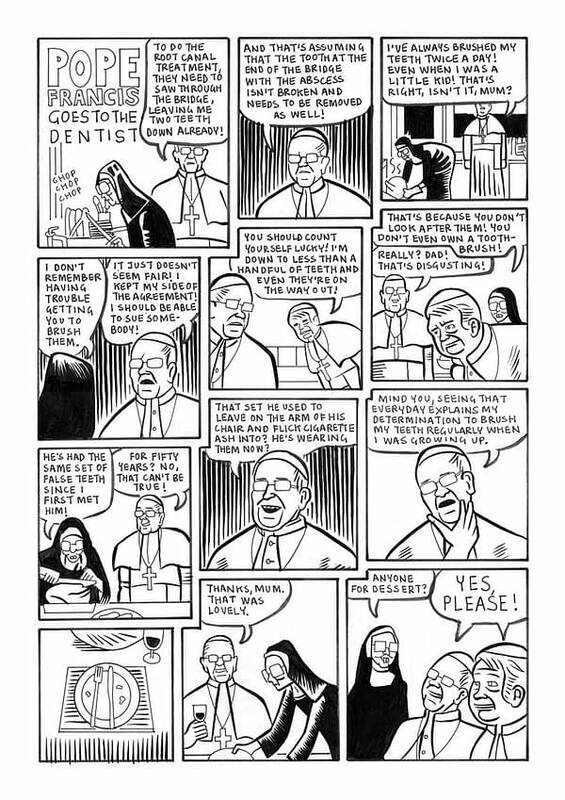 A compilation of strips, mostly involving Pope Francis and his obsession with his local dentist – I say local, but it appears to be in British suburbia. Oh and his dad is also a Pope. And his mother is a nun. This is never commented on but it makes for a slick suburban sitcom that is the funniest, surrealist sketch that Monty Python never did, with lines that ground this most ridiculous situation with the mundane. Add a few appearance of the 14 Year Old Stand-Up Comedian and the French artist Monsieur Octopus and this is a real gem of 2016. 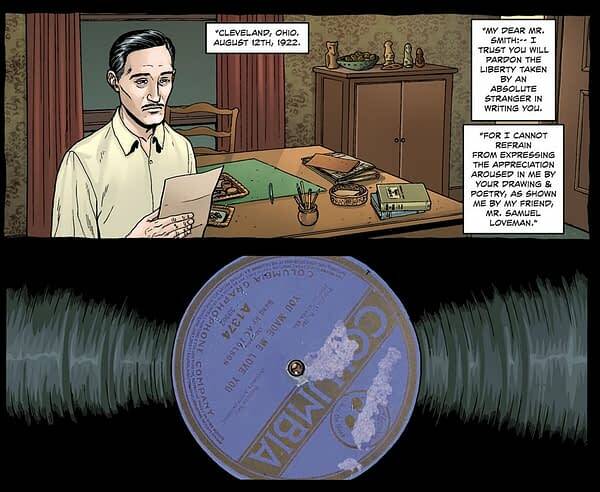 This issue of the League Of Extraordinary HP Lovecrafts comic Providence marked the first time that I realised how Alan was using the actual name of Lovecraft in the story, a magical term, a way of making people love, to obsess, to have desire for someone or something else through whatever means possible. It was achieved through the repeat image of the song “You Made Me Love You” until the dissonant images hammered it home. Jacen Burrows making each oh-so-similar image distinct as he rips the comic book through the decades, in a way that outdid Eddie Campbell’s similar portrayal of passing time in From Hell. It’s been said that good writers give readers the chance to fill in the circle themselves, it’s all about judging how wide a gap to leave. In Providence, Moore leaves wider circles than most, but they are such a thrill when you make that jump. Providence is published by Bleeding Cool’s publisher, Avatar Press. No Mercy #9 by Alex De Campi and Carla Speed McNeil. From the opening page of this teen survival story flashback issue, there is incredible disconnect between expectations and reality, never more effectively portrayed than with the facial expressions of the characters and the double meaning of “coming out” in high society, as well as what is meant by “be yourself”. No word is wasted, every syllable targetted in one direction, from beginning to end it’s a devastatingly clever, poignant and angry take on the gap between children and their parents. And then the gap becomes so wide it breaks your heart, and you spent the rest of the comic looking for the light amongst the dark – until you find it. If you squint. A possibly perfect comic book. For emotional effect, no other comic came close for me in 2016. Chew #59 by John Layman and Rob Guillory. An example of one of the greatest bait and switches in serialised comic book history. Chew has always been a most entertaining comic, telling the story of an impending alien invasion, the banning of eating chicken worldwide, and super powers related to food emerging all over the place, all dovetailing together. But with its penultimate issue, John Layman wrote something very special. We’d already had a teased vision of the future that turned out to be a vicious tease for the audience, but we were grateful for the dodge, the people we thought would die, didn’t, it was all beautifully explained away in a previous issue as it headed for its denouement. And then with #59, it did it all anyway. This issue was a masterpiece of structure, and its a credit to Guillory that he created such depressing scenes while maintaining the cartoony style that had defined the look of the series. One of the crueller pieces of torture inflicted upon an audience and masterfully cast.